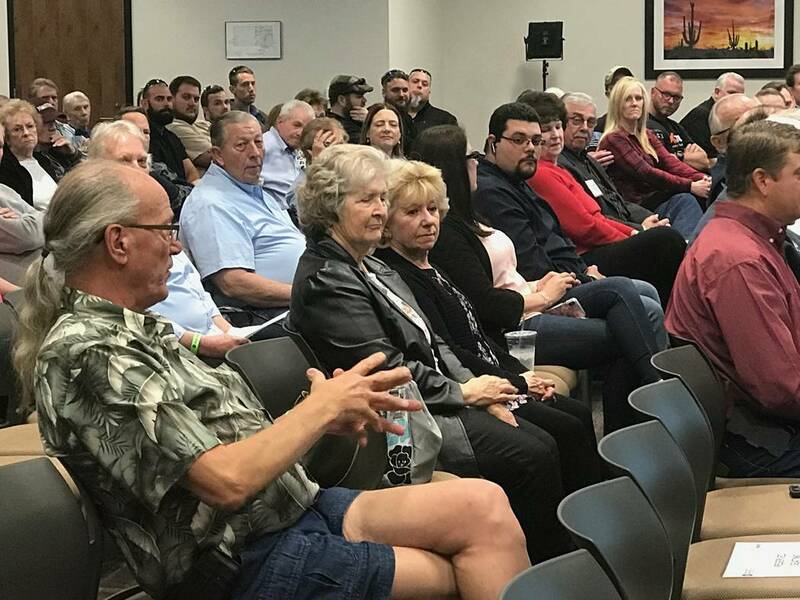 About 100 member-owners from Valley Electric Association Inc.’s south Pahrump voting district, employees of the cooperative and media members packed into Valley’s conference center for the cooperative’s annual district meeting for the area. 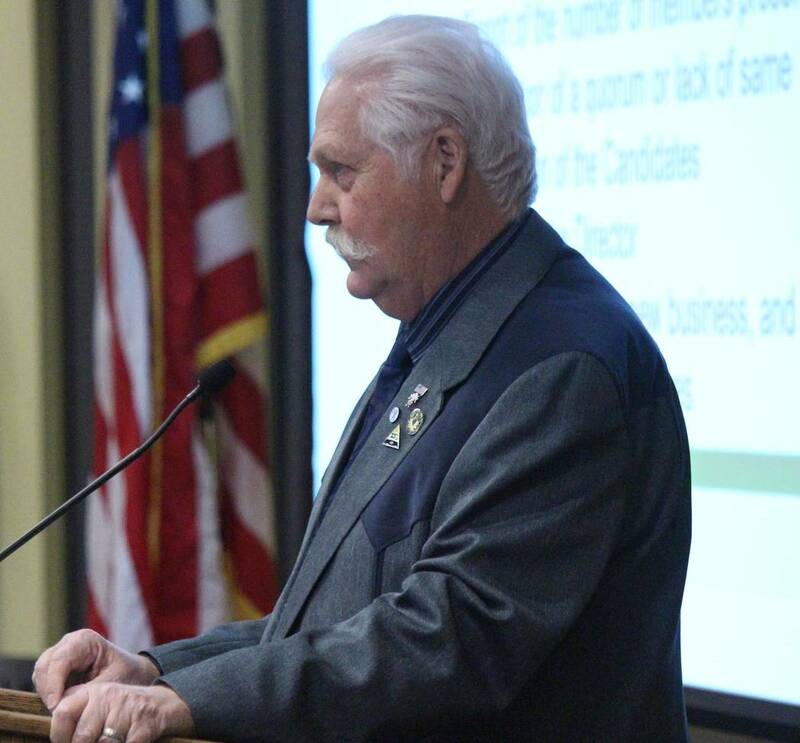 Jeffrey Meehan/Pahrump Valley Times Three-time incumbent for Valley Electric Association Inc.'s District 1 (south Pahrump) board of director seat speaks on the area's annual meeting on March 22, 2018. Gazsy won his re-election bid for a fourth term that night. Jeffrey Meehan/Pahrump Valley Times Tom Husted, CEO of Valley Electric Association speaks at the cooperative's annual District 1 meeting on the health of the organization and plans for the future on March 22, 2018. Husted covered several things including the expansion of fiber-optic lines in Pahrump and beyond, along with other financial positives at Valley. Jeffrey Meehan/Pahrump Valley Times Member-owners of Valley Electric were able to ask questions of Valley Electric at the cooperative's annual area meeting on March 22, 2018. Several members voiced both positive and negative feedback on the cooperative's recently launched digital television product and its digital phone service and broadband during the meeting. Jeffrey Meehan/Pahrump Valley Times The final ballots are tallied for Valley Electric Association's board of directors position in District 1 (south Pahrump) on March 22, 2018 at the cooperative's annual area meeting at 800 E. Highway 372. Peter Gazsy, three-time incumbent, was re-elected for a fourth term at the meeting. 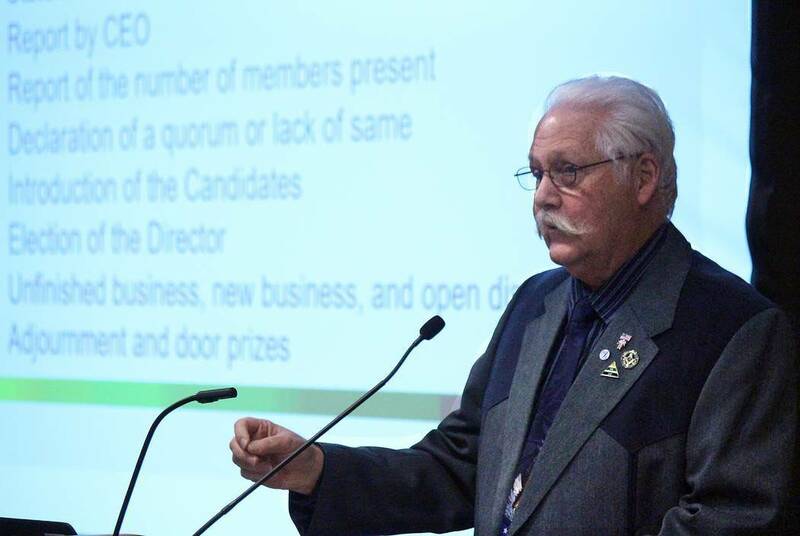 Jeffrey Meehan/Pahrump Valley Times Three-time incumbent, Peter Gazsy, for Valley Electric Association Inc.'s District 1 (south Pahrump) board of director seat speaks on the cooperatives annual area meeting on March 22, 2018. Gazsy won his re-election bid that night with 439 votes, second to Michelle Caird with 351 votes. 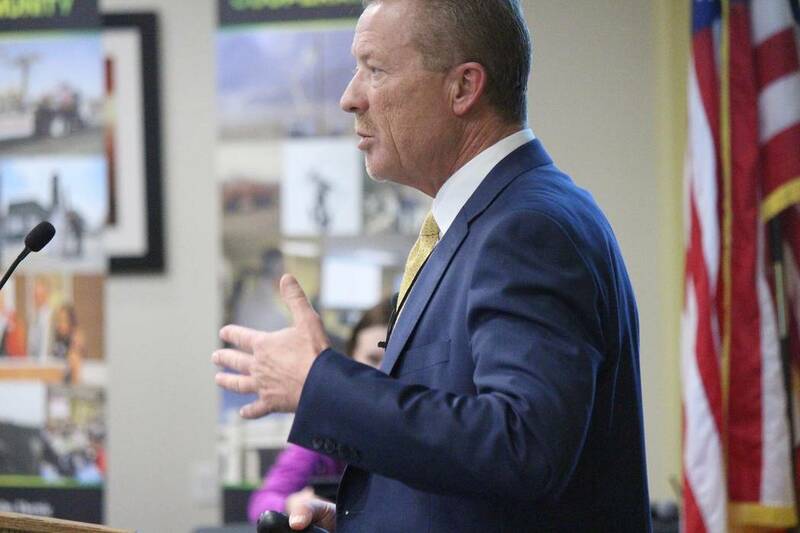 The March 22 evening event at Valley’s conference center at 800 E. Highway 372 that lasted roughly two hours was also packed with information about Valley Electric’s finances, growth prospects and future investments, along with information on its associated companies. One of the main portions of the event was voting, and subsequently announcing the winner, to the board of directors’ race for Valley’s District 1, which encompasses the south Pahrump area. Thomas Husted, CEO of Valley Electric Association Inc., was a keynote speaker on what’s going on at the cooperative, who said value was delivered to the communities Valley Electric served in 2017, in what he called a “historic” year for the organization. Husted noted that the cooperative had a record year-end margin of $61 million, paid down $80 million in long-term debt and banked $30 million into a future rate-stabilization fund in 2017, during his highlight of the cooperative’s financial health. Electric rates for Valley’s member-owners are projected to be stable through 2024, barring any catastrophic events or events beyond the control of the cooperative, Husted said. Many other topics also were discussed at the meeting, including energy choice, the cooperative’s entrance into TV and digital phone services and what’s next for Valley Communication Association’s fiber-optic upgrades in Pahrump and beyond. The sale of the cooperative’s 230-kilovolt transmission system, which closed in 2017, to Gridliance Holdco, sold for just under $200 million. Peter Gazsy, three-time incumbent for Valley’s District 1 was voted in for a fourth term during the March meeting with 439 votes. Gazsy, who has worked as a general contractor in Pahrump, a substitute teacher for the Nye County School District and a paraprofessional for NCSD, will serve a three-year term. Valley’s six board members, one from each district, work to decide such things as hiring the cooperative’s chief executive officer, along with establishing the overall direction of the cooperative on such items as whether to go into broadband, according to Michael Hengel, executive vice president of corporate communications at Valley Electric. The candidate with the second highest number of votes was Michelle Caird, who came to the race bringing 18 years of experience on the board at a cooperative in Washington state. Caird carried 351 votes in the race. In descending order, the candidate with the third highest number of votes was Tom Maher with 215 votes; followed by Andy Alberti (174); Jack Biddison (86); Donald Peterson (73); John Carrell (69); and Peter Shield (64). Peterson had dropped out of the race early on, though he collected 73 votes. All the candidates, excluding Peterson, had faced off in a debate on Feb. 20 at Valley’s conference center. District 1 member-owners of Valley Electric were able to cast their vote online through March 14, along with mailing in their ballot by that date. 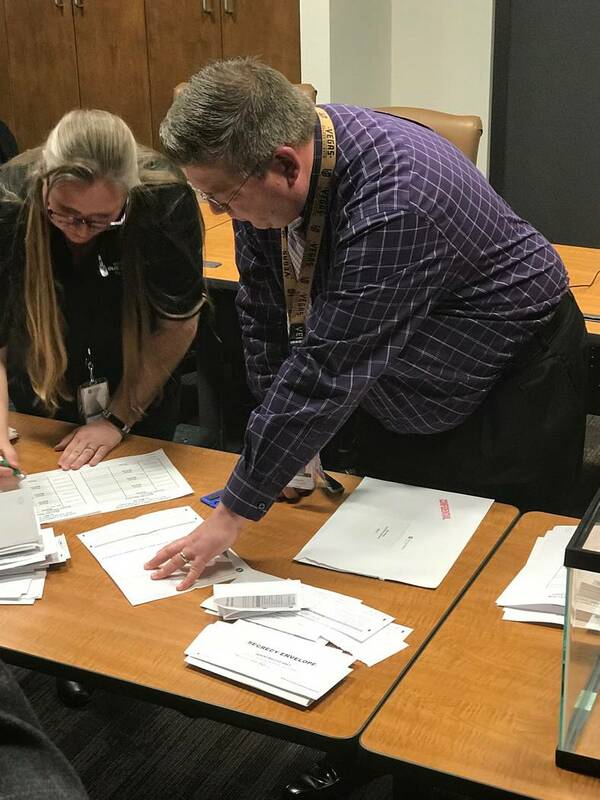 Members were also able to vote by dropping off the ballots in person at Valley’s office in Pahrump by the end of the day on March 21, as well as voting during the district’s annual meeting on March 22. Overall, out of the 9,575 members in District 1, the total members who participated were 1,532 – surpassing the number needed for a quorum. According to the cooperative’s bylaws, 2 percent of the membership must participate in the elections for a quorum. Less than a hundred of the total votes were cast during the District 1 meeting in March. Alberti did question how the winner in the board of director’s race was chosen in District 1 during the annual meeting, asking if there would be a run-off election due to the fact that no one had gained a majority number of votes – over 50 percent of the more than 1,200 votes. The cooperative’s attorney notated that the winner was not elected by a majority of the total vote but by the highest number of votes tallied, as compared to all candidates, during the meeting. Valley Electric holds elections for two of its six districts each year. District 3 also held elections in March, where longtime businessman and Beatty resident Rick Johnson was re-elected to a third term to the board of directors. At the Pahrump meeting, Valley’s member-owners were also able to engage with some of the cooperative’s executive members and voice their concerns pertaining to the family of organizations. Peter Gazsy, three-time incumbent for Valley Electric Association Inc.’s District 1 (south Pahrump) won a fourth term as board of directors for the area. Six other candidates competed for the position: Michelle Caird, 351 votes; Tom Maher (215) votes; Andy Alberti (174); Jack Biddison (86); Donald Peterson (73); John Carrell (69; Peter Shield (64). Peterson had dropped out of the race early on, though he collected 73 votes in the race.